“Ronnie Cutrone, an artist, nightclub impresario and longtime assistant to Andy Warhol whose job required him to make unusual and highly personal contributions to some of Warhol’s canvases, died last weekend at his home in Lake Peekskill, N.Y. He was 65. Ronnie Cutrone operated nightclubs and contributed to Andy Warhol’s creations. His former wife Kelly Cutrone confirmed the death. Mr. Cutrone died either late Saturday night or early Sunday morning, apparently of natural causes. As a painter, Mr. Cutrone was a representative of the school often called post-Pop. 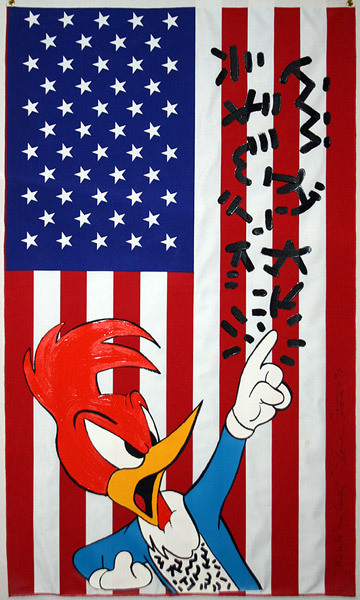 In his best-known pieces, he painted cartoon characters like Woody Woodpecker and Donald Duck onto American flags and those of other nations. His work has been exhibited at the Museum of Modern Art, the Brooklyn Museum and elsewhere. Mr. Cutrone was equally renowned as someone who had known almost everyone, and tried almost everything, in the New York art world of the 1960s and after, bridging the sea change from Pop to punk. A fixture of the Factory, as each of Warhol’s Manhattan studios was known in turn, Mr. Cutrone took an evocative series of stereoscopic color photographs, never exhibited, that document daily life there. The series includes images of Warhol at work and shots of the Factory’s cast of A-list visitors, among them Mick Jagger, Debbie Harry, Dennis Hopper and Paloma Picasso. In later years, Mr. Cutrone was part of the darkly glittering downtown gallery-and-club scene chronicled by writers like Jay McInerney and Tama Janowitz. Ronald Curtis Cutrone was born in New York City on July 10, 1948, and studied at the School of Visual Arts in Manhattan. He had begun hanging around the Factory, then on East 47th Street, in the mid-1960s, while he was still in high school. His abrupt introduction to Warhol had come shortly before, when, according to the Web site warholstars.org, they collided at a party while attempting simultaneously to step over a supine Bob Dylan. As a young man, Mr. Cutrone was a go-go dancer who performed with the Velvet Underground, the influential proto-punk band whose members included Lou Reed and John Cale. He went on to work for Interview magazine, which Warhol founded in 1969. In 1972 Mr. Cutrone became Warhol’s assistant, a post he held for a decade. The job description entailed duties unlikely to be found on anyone else’s curriculum vitae. Mr. Cutrone also contributed materially to Warhol’s Oxidation paintings, a series of abstract images overlaid with a ghostly greenish patina. The paintings consisted, in the words of a 2008 Christie’s auction catalog, of “metallic pigment and urine on canvas.” Warhol supplied the pigment. Mr. Cutrone supplied the urine — for at least some canvases in the series. At his employer’s request, Mr. Cutrone took large doses of vitamin B, which Warhol believed imparted an especially lovely color to the finished product. Mr. Cutrone’s first two marriages, both to Gigi Williams, ended in divorce, as did his third, to Kelly Blanding. (As Kelly Cutrone, she is a fashion publicist known to television viewers for her regular appearances on the MTV reality show “The Hills.”) His fourth marriage, to Einat Katav, also ended in divorce. No immediate family members survive. With Kelly Cutrone, Mr. Cutrone produced a much-talked-about performance piece, “Love-Spit-Love,” in 1991. Billed as an “installation of living American nudes,” it featured three unclothed couples — one gay, one lesbian, one straight — kissing and caressing as visitors looked on. In 2000 Mr. Cutrone opened the Rubber Monkey, a TriBeCa nightclub that is no longer in business. 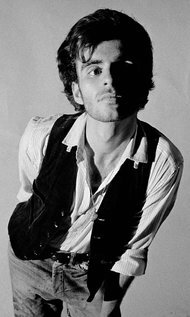 He had previously helped design and run the Mudd Club, the lodestar of the downtown punk scene that flourished from 1978 to 1983. View our Ronnie Cutrone collection here.